The San Diego Police Department confirmed that a home robbery occured at around 11:50am on Friday, April 5 at a house along Ashford Street in Clairemont, near Lindbergh Neighborhood Park. 58-year-old Randy Tiang was inside the home at the time of the robbery. He was not breathing and suffering from trauma to his upper body when his son and police arrived at the scene. SDPD officers began CPR on Tiang, until being relieved by San Diego Fire-Rescue personnel. Tiang was taken to an area hospital and treated in an intensive care unit where he remains. A safe was reportedly taken from the home. Police do not have a suspect in custody and are currently looking for any information to help in locating the perpetrators. 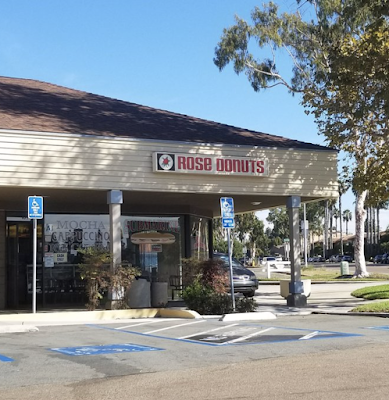 As of this past Saturday, the 37 year old Rose Donuts location at 7612 Linda Vista Road in Clairmont remained closed with a sign posted to the front door that read - "Closed indefinitely until further notice. Thank you for understanding." The location at 5201 Linda Vista Road is separately owned and operated and remains openn. Friends of the victim are raising funds via a GoFundMe campaign to help assist with medical expenses, funeral costs and loss of income. We encourage readers to help in any way they can to support a local family in need. We received information that Randy passed away on the evening of Monday, April 8. Anyone with information regarding this incident is asked to call the Homicide Unit at 619.531.2293 or Crime Stoppers at 888.580.8477.